Some good came out of Britain’s attempt to take over the world. In my native Hong Kong, a territory under British colonial rule for 150-plus years, our people appropriated the English tradition of drinking tea with a splash of milk. Like anything that was born in one place and that has traveled great distances and settled someplace else, milk tea was absorbed into Cantonese culture and took on its characteristics. In our subtropical climate, fresh milk was scarce, and so we used shelf-stable substitutes instead, in the form of evaporated and condensed milk. In Hong Kong, it’s served iced or hot in diners known as cha chaan teng. There, people order dishes that straddle the Chinese-British divide—fluffy egg sandwiches, ham and macaroni in broth, baked chicken mini-tarts—and the obligatory drink served alongside is the creamy, smooth, dairy sweet Hong Kong milk tea. Cha chaan teng restaurants can be grungy and cramped, but they discriminate against no one, with newsstand hawkers and real estate tycoons dining shoulder-to-shoulder. 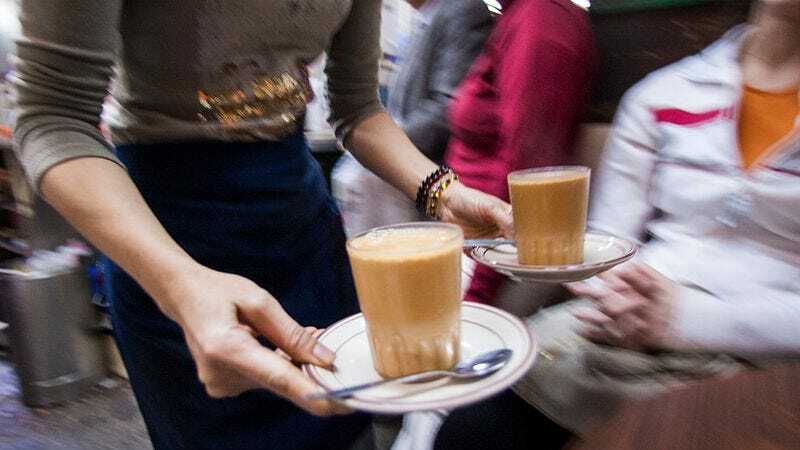 With an estimated 2.5 million mugs of milk tea consumed in Hong Kong each day, the drink is every bit as ubiquitous as coffee. And yet, no one definitive recipe for milk tea exists. We Cantonese are as business-savvy as we are paranoid, and we protect our proprietary recipes with black-site-level secrecy. So every diner has their own classified method, all claiming to be the best around. But the basic outline is this: Black tea leaves—typically Ceylon, orange pekoe, Assam, or some combination—are given a robust brew, often steeped multiple times to extract maximum flavor and tannins. Finer brewers then pour the batch through a cloth strainer, supposedly making the final product smoother. Adding evaporated milk is a must, and it’s either sweetened with sugar or (richer and tastier in my view) condensed milk. Up until my mid-20s, my relationship with milk tea had been a one-way street. I’d order an iced version at Cantonese restaurants, but it never occurred to me that I could make one at home. When I finally decided to attempt one in my kitchen, I realized just how difficult it was to crack the milk tea code. Most who drink tea enjoy its purity and believe little should be done to mask its flavors. So unless you’re in Southeast Asia or in a Chinatown somewhere in the world, you’ve likely not enjoyed tea that’s thickened and sweetened. Which is to say, I had a specific taste memory in my mind, and because we’re dealing with a product measured in milliliters, eyeballing ratios invariably led to inconsistent results. Via my thumb-to-the-wind method, I was nailing a 90 out of 100, but hitting those last 10 percentage points to attain milk tea nirvana required some level of finesse. A 100-score milk tea is a treat but not an overindulgence. It’s velvety, smoky, rich, and extra smooth, with an appealing taste of fresh cream that lingers on the palate. Whatever I’d consider “just sweet enough,” it should be half a notch below that level. I finally sat down with a plastic tub of tea bags, several cans each of evaporated and condensed milk, and attempted to solve this via the scientific method. Of utmost importance is the tea bag you select. In the U.S., the most widely available tea bag would be English breakfast, but I find its floral quality and spice to be a bit intrusive. Irish breakfast, which leans heavier on Assam leaves, gets closer, with a maltier and smoky flavor. But if you can get your hands on Tetley orange pekoe from Canada, it’s head and shoulders better than any tea bags commercially available in America. Lipton also sells a Yellow Label Assam tea that’s not widely found in the U.S., but available online. As you heat the filtered water in a kettle, place two tea bags in a large mug. Once the water boils, let it sit for 45 seconds before pouring 10 oz. of 195 degree Fahrenheit water into the mug. Let this steep for four minutes, as the water transforms into a dark coppery red tea. I add the milk with the tea bags still sitting in the drink, because I like to extract the fullest-bodied, smokiest flavor possible. The important thing here is to keep stirring. If it sits too long, the milk will form a layer of fat on your tea, and the skin will be impossible to reincorporate into the drink no matter how aggressively you stir. So keep the spoon stirring for 30 seconds, until the condensed milk is completely dissolved. You know the tea is done when it achieves this tan, brickish hue with a shade of orange. There should be a sheen to the tea, and stirring it with a spoon, you should feel some body to the drink; that is, it should not be watery or thin. For an iced version, rather than deal with the dilution of ice, just make a big batch of hot milk tea, let it cool enough where you can fill into an ice tray, then use the frozen milk tea cubes to chill your drink.